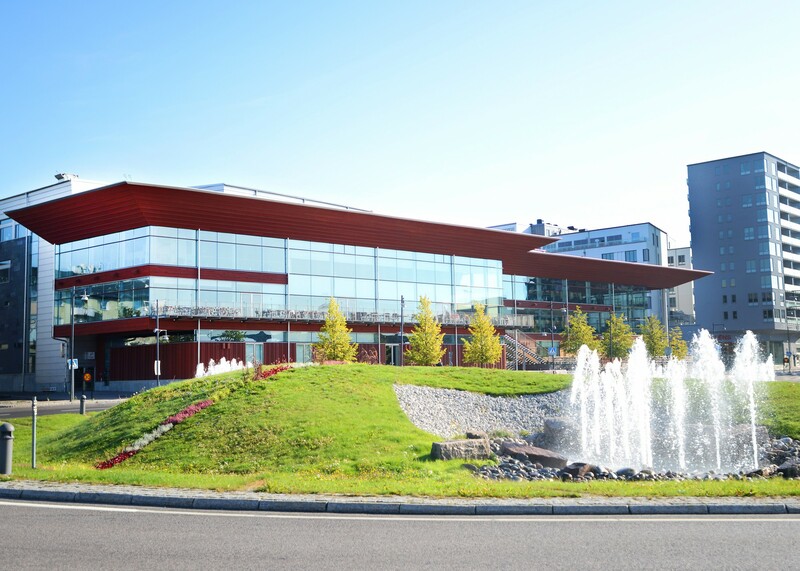 The Kunsthalle is the biggest exhibition venue of the biennial and is located in Kulturens Hus, Luleå, which, besides the art galleries, also houses a library, restaurant, concert hall, café and conference rooms. The building was finished in 2007, designed by Tirsén and Aili architects. It is centrally located by the northern harbour of Luleå. The art gallery is accessible by wheelchair and has a hearing loop. Directions: Konsthallen is located inside Kulturens Hus in central Luleå, the nearest bus stop is Smedjegatan. Please visit Luleå Lokaltrafik's website for timetables and other information: www.llt.lulea.se. Parking spots are located in the basement of the building. Norrbottens museum is a county museum that focuses on the Northbothnian cultural heritage, both historical and contemporary. Collections and exhibitions are based on current issues, historical stories, culture and society and are aimed at all ages. Norrbottens museum's activities also extend to other places in the northern part of the country where the meeting with nature and cultural history takes place outside of the classic context of the museum. The multicultural history of Norrbotten is reflected in the museum’s rich collections and archives that consist of thousands of objects. The archive is available to the public and contains publications, photographs and documents about the county's natural and cultural history, then and now. The museum also houses a café and a museum shop where Northbothnian craftsmanship and literature are available for purchase. The Luleå Biennial will host exhibitions on the third and fourth floors of the museum. – Parking spaces are located behind the museum at Köpmangatan. – Parking for disabled people is at the entrance, via the museum park. – Wheelchair chair and lift available. Norrbotten Museum is located in central Luleå and is easily reached by foot, the nearest bus stop is Luleå Hermelinparken. Please visit Luleå Lokaltrafik's website for timetables and other information: www.llt.lulea.se. Galleri Syster is an artist-run gallery that opened in 2006. The gallery functions as a meeting place for art, conversations, experiments and new ideas. Since the beginning, the focus has been on Swedish contemporary art, which they have created a new scene for in Norrbotten. In recent years, the gallery has also broadened its programme to include international artists. Galleri Syster rests on feminist foundations, working parallelly to the larger institutions. For the last five years they have also run Galleri Lillasyster, a space for young people interested in learning about and discussing contemporary art and meeting with professional artists. Some of the members in the group will be working as art guides during the biennial. The gallery is adapted for wheelchair users. Gallery Syster is located in central Luleå. The gallery is easily reached by foot or by bus to Luleå Varvet (Varvet). Please visit Luleå Lokaltrafik's website for timetables and other information: www.llt.lulea.se. From January 13, until February 17, only open by appointment. Please contact +46 0921-930 41. Havremagasinet is a county art gallery in Boden established in 2010. Six stories tall, the building used to be the central storage for the northern military region from the year 1913 to 1950, and supplied the units in Boden, Kiruna and Umeå with food. The building, which is the largest in Boden, was design by the architect Erik Josephson. Havremagasinet presents a wide exhibition programme spanning local cultural history, Nordic and international contemporary art. The biennial exhibition will take place in the basement of the building. 50 SEK for all exhibitions in Havremagasinet. Havremagasinet is located in Boden, about half an hour's drive from Luleå. By public transport, line 4 towards Vittjärv is the best choice, get off at Norrbottensvägen stop during weekdays. During weekends, take line 2 towards Heden, and get off at the stop Hedenbrovägen. If you are arriving by local train service, go to the station Garnis, after that it’s a five-minute walk to Havremagasinet. Please visit www.ltnbd.se for county traffic time tables. Rödbergsfortet is one of the five forts that make up the fortress of Boden, and was the last to be taken out of use. The fort was established south of the city, on Rödberget, 1903~1908 and today is classified as a protected building. 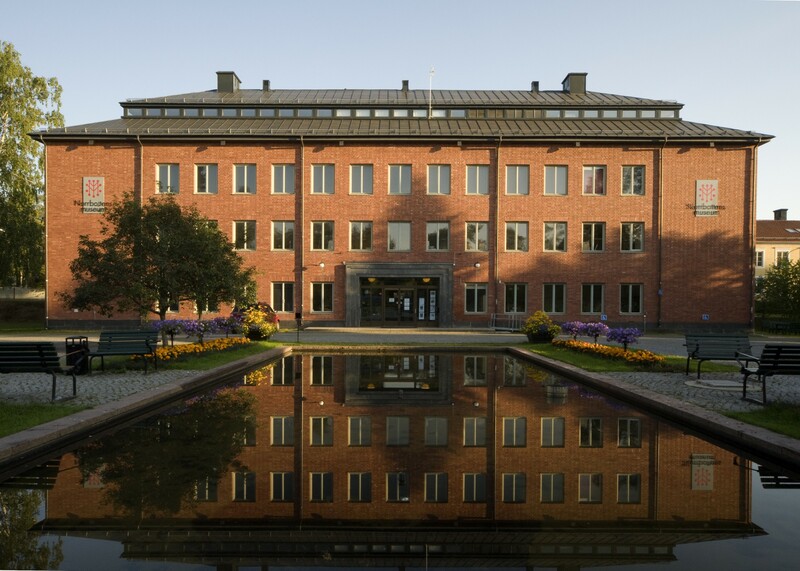 When the Swedish military shut down Rödbergsfortet in 1997, the State Property Agency took over the management of the facilities. 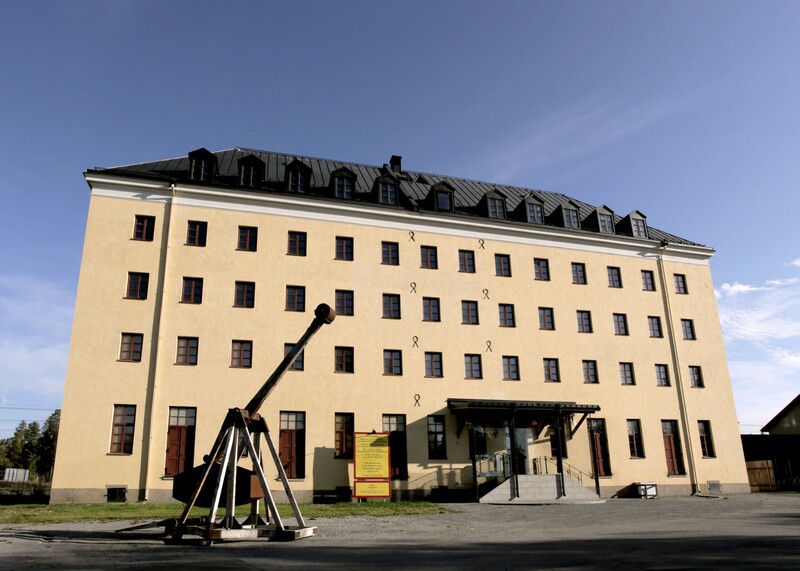 Today, the fort is the only one that can be visited and is maintained by private initiatives and in collaboration with the Defence Museum in Boden. During the biennial, the fortress will be turned into a very unique exhibition space. Mjölkuddsberget, located just outside of Luleå, will be the venue for a site-specific work during the biennial. Mjölkuddsberget was used as a military fortress during World War II, but later converted into an electricity management centre. Today, the facilities are privately owned. Ájtte exhibits objects and craftsmanship that tell stories about Sapmi's history and culture. The permanent exhibition is built as a reindeer pasture, where you enter the exhibition through a long aisle, which leads to the round centre of the exhibition, and then back out to the other rooms of the museum. Here you will find animals, nature and culture from the entire fell district. The artists of the biennial will be exhibited inside the museum's permanent exhibition in dialogue with its thematics and objects. – The whole museum is accessible by wheelchair. The easiest way to reach Åjtte is by car, but it is also accessible by bus and on foot. 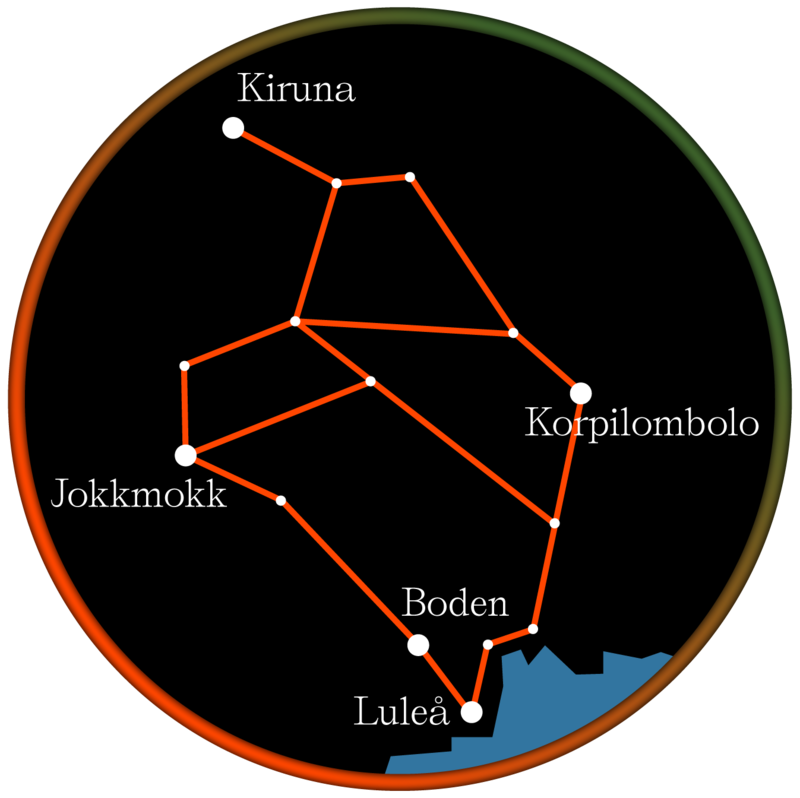 A bus to Jokkmokk departs from Boden, Gällivare, Arvidsjaur, Murjek and Luleå. From Jokkmokk Bus Station, Ájtte is a ten minute walk away. Please visit Länstrafiken Norrbotten's website for timetables: www.ltnbd.se/tidtabeller. Kiruna Konstgille is an nonprofit association founded in 1944 and has since then been actively working with art in Kiruna. Since 2018, the association has been operating in a new art gallery adjacent to the Citygalaxen mall. Kiruna Konstgille is a member of The National Association of Swedish Art Societies. The biennial will take place in their store front window on Föreningsgatan 15. The night festival started in 2005 and is a tribute to the night. Then, little Korpilombolo shines like a pearl in the polar night, while the night's thoughts develop through poetry, music, philosophy and art. The festival is celebrated every year, 1–13 December, and is organised by the Korpilombolo Cultural Association, a non-profit association that aims to create an active cultural life in the local community. The Cultural Association houses its own cultural centre and, in addition to the night festival, runs a lunch restaurant, monthly art exhibitions and courses. It is an important local meeting place that also helps create a good living environment by, among other things, helping citizens mow their lawns and shovel snow. During the first days of the night festival, the Luleå biennial will participate with a unique night-performance. Korpilombolo can be reached by car or bus via Länstrafiken Norrbotten: www.ltnbd.se/tidtabeller. Folkets Bio (The People’s Cinema) in Luleå is a non-profit, religiously and politically independent cultural association whose goal is to broaden the film repertoire in Luleå. 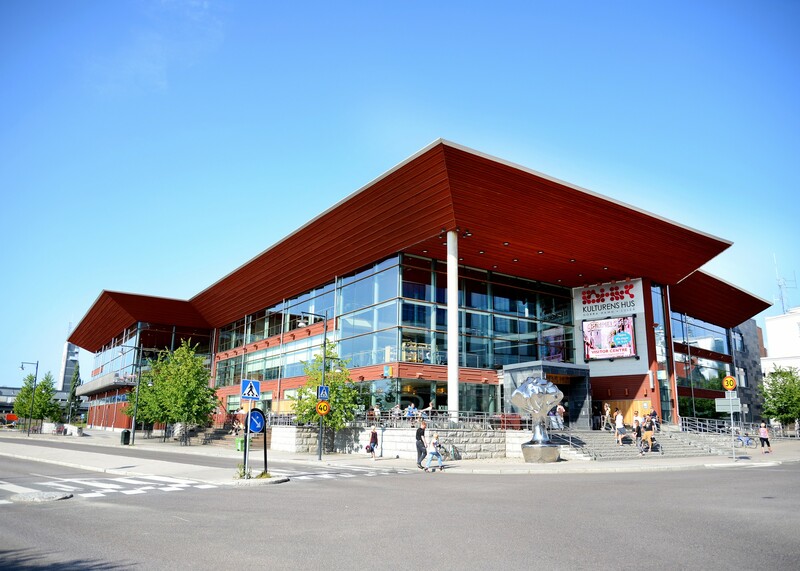 They collaborate widely with cultural and other associations and the activities take place at the cinema Royal on Nygatan 1 in central Luleå. In collaboration with Folkets Bio, the Luleå Biennial will curate a three-part film programme. A light installation by the artist Vishal K Dar can be seen along the south side of the central peninsula of Luleå on three sites - the barge by Bergnäsbron, the crane in Södra Hamn, and the Cementa silos. Svartöstaden, just south of Luleå, is an old working class district with a historical shanty town settlement. Svartöstaden is now the most well preserved shanty town in the country. Because of the industries, including the steelworks, located between the district and central Luleå, Svartöstaden has retained its own distinct character. Folket hus (the People's house) in Svartöstaden - Blackis - will be the venue for the biennial's conference during the closing weekend. More info to be announced in January. By car, drive south from central Luleå via Svartövägen. By bus take line 7 to the stop Laxgatan. 250 km north of the polar circle in Kiruna municipality the village Lainio is located, here the northernmost human habitations exists. Marttigården is a museum and an active place for the local culture with a big amount of objects from the peasant society's households. The place has been particulary important for the public participation and identity for the women of the villages. They have managed these buildings, archived the everyday life and work, and in that way preserved the cultural heritage.